Your need: One person consumes an average of 350 g a year. Brussels sprouts produce quite a tall stalk (50 to 70 cm) with green-white or red-white sprouts positioned in a spiral around the stalk. 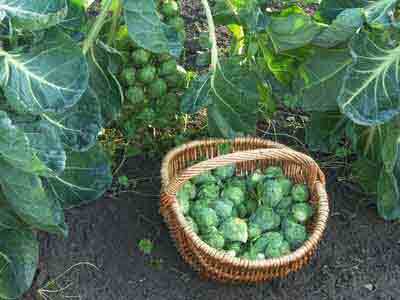 The sprouts can reach a diameter of 10 to about 50 mm. They need a sunny to partially shaded location with good, loose garden soil. Brussels sprouts propagate from seeds. They are moderately winter-hardy. In very cold regions, the whole plants must be overwintered in a protected, shaded location. Multiple frosts below -10°C will damage the sprouts. It is possible to grow them in batches at intervals of time. Plant the young plants quite deep and water well. When the first sprouts have grown (in autumn), pinch out the growing tip, so that the sprouts grow to a larger and more even size. Regularly remove rotting buds and yellow leaves. Preventative measures: Always keep the soil moist and hoe regularly to keep flea beetles away. Regular wiping down can remove eggs or caterpillars from cabbage whites. Brussels sprouts are harvested from the bottom to the top of the plant. If the Brussels sprouts are not harvested then, after overwintering, in spring they will produce shoots which will bear flowers in summer. Brussels sprouts freeze really well. Brussels sprouts taste good as a salad as well as a cooked vegetable. One person consumes an average of 350 g a year. Der Pro Kopf Rosenkohl Verbrauch liegt bei etwa 0,35 Kilo jährlich. Quellen: BLE; BMELV; DESTATIS; LfL Stand: 14.03.2013.